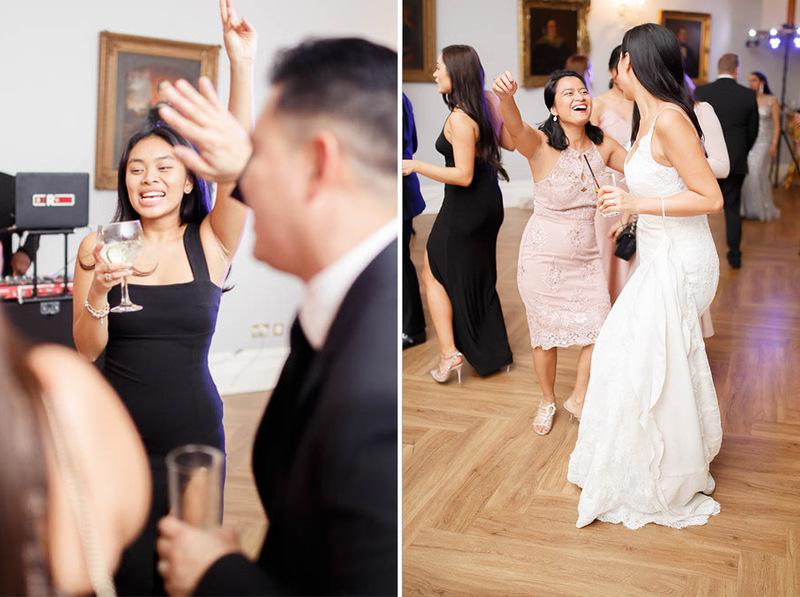 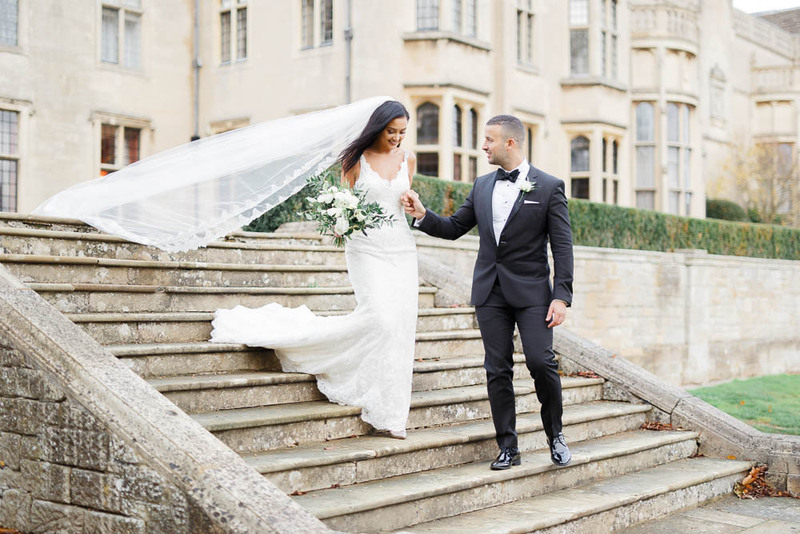 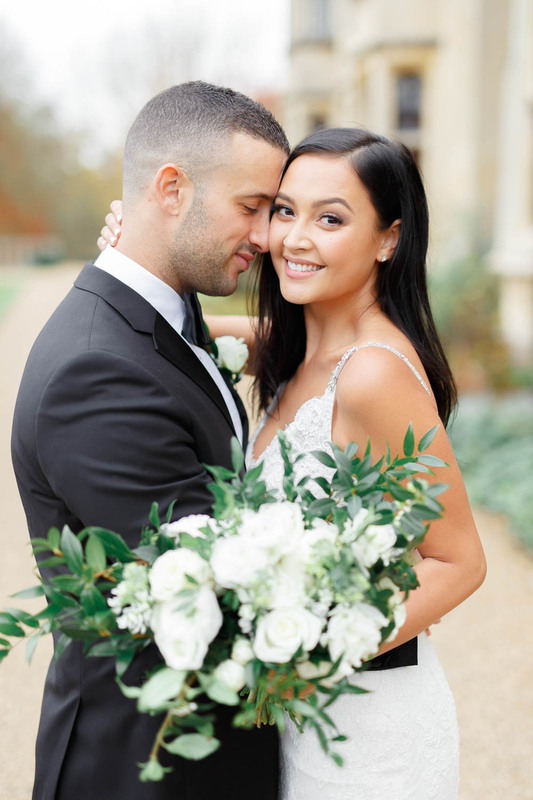 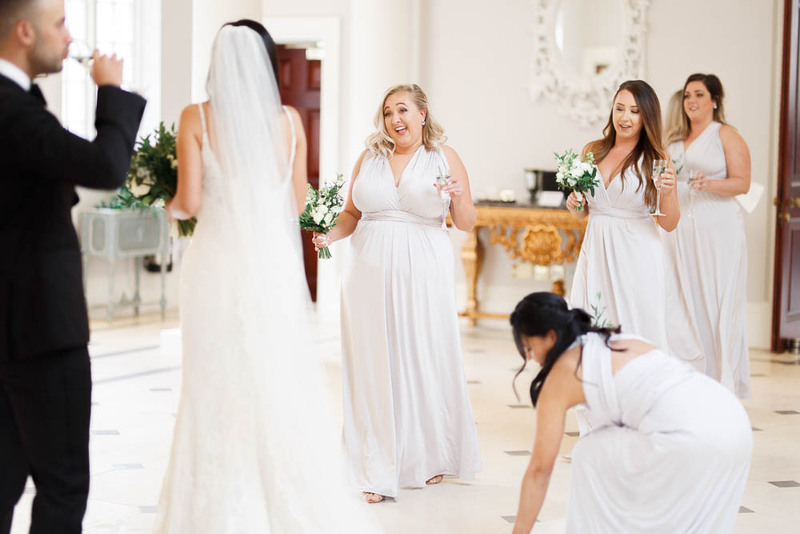 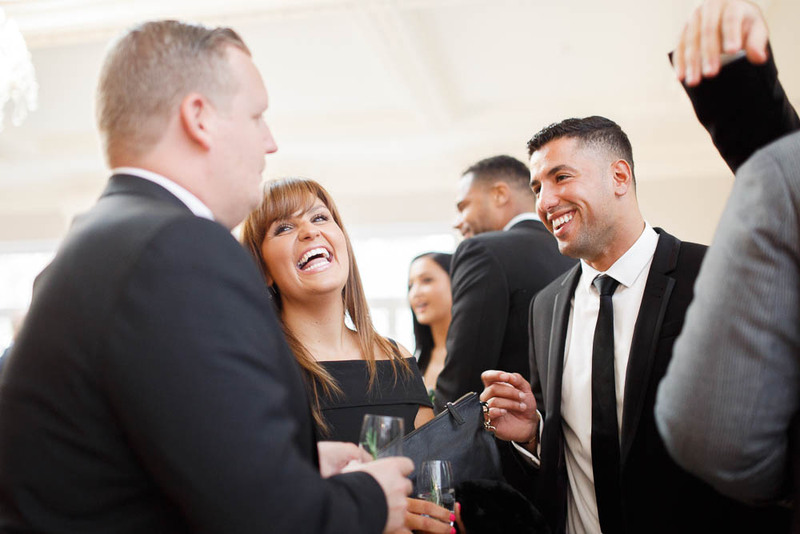 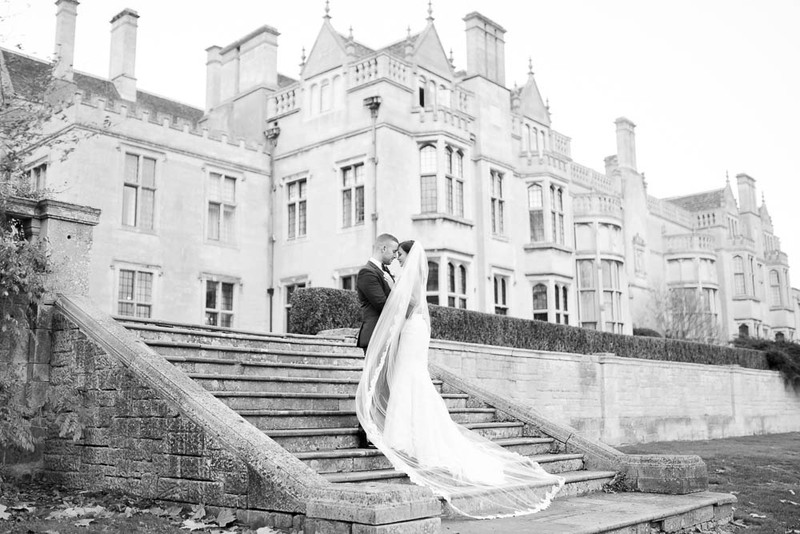 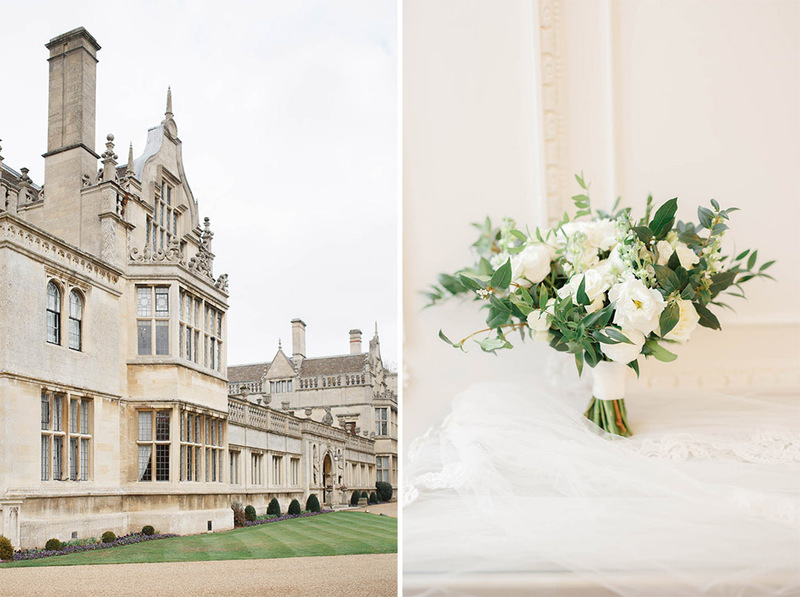 Josefina & Yas had the most spectacular, elegant wedding day in the orangery at Rushton Hall, Kettering. 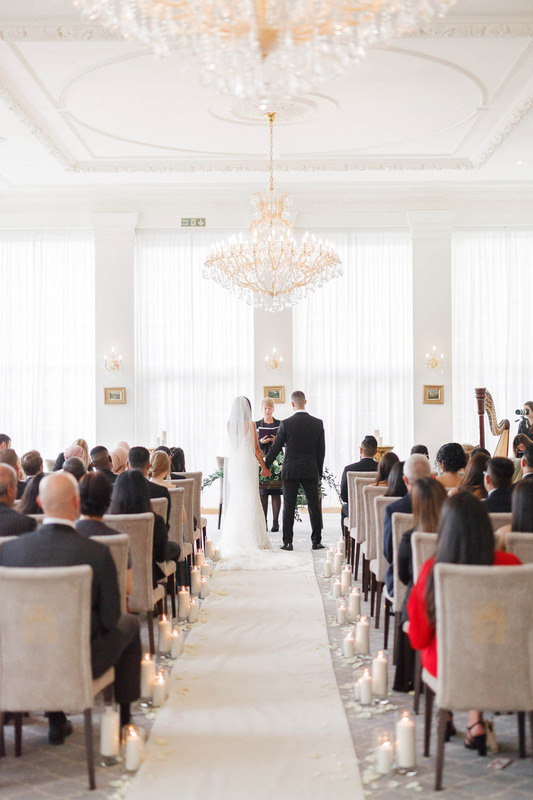 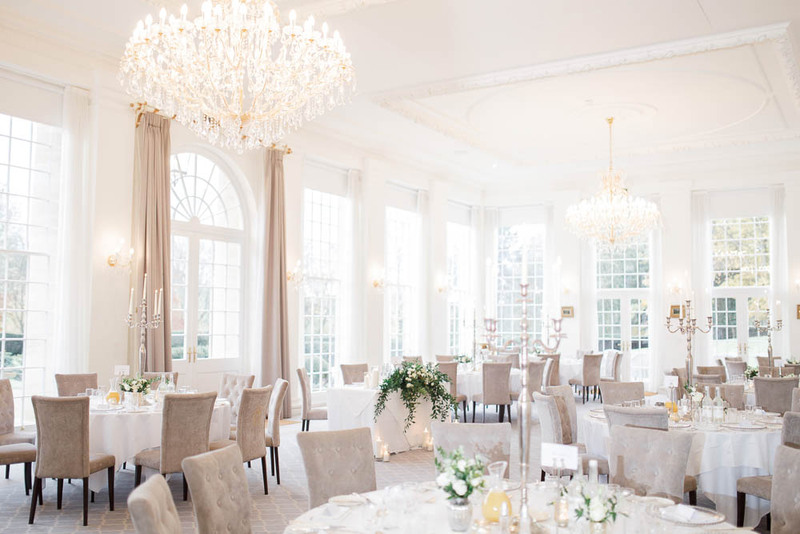 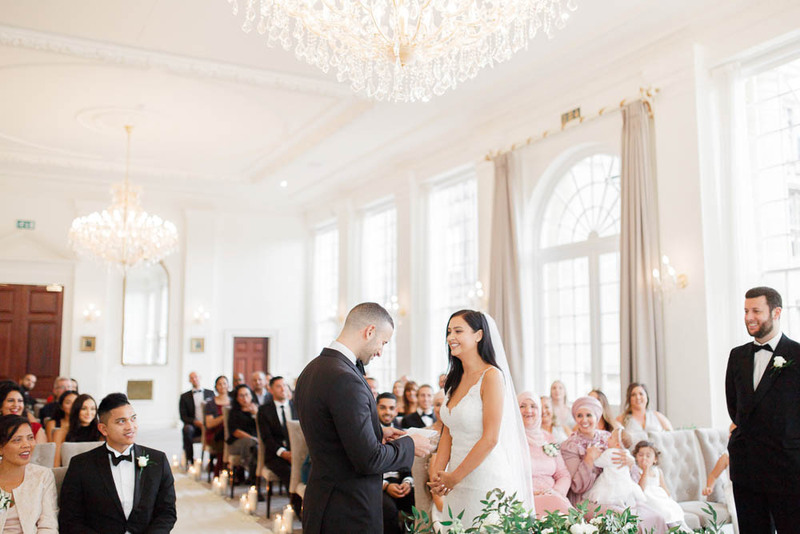 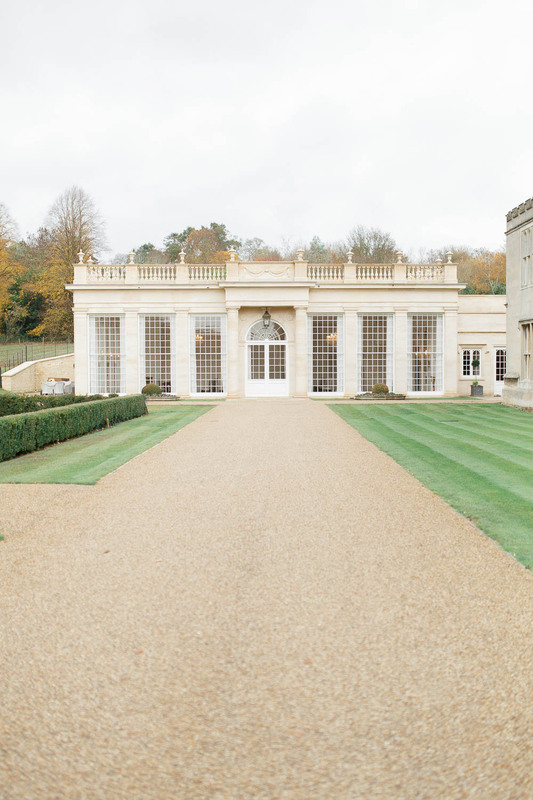 From the moment we arrived, the new orangery took our breath away – it is a new addition to the venue, and is simply flooded with light. 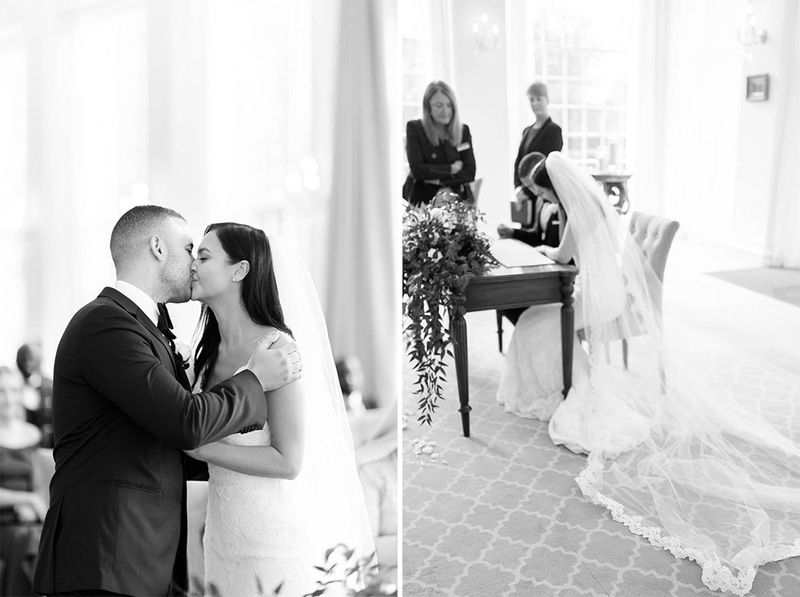 A photographer’s dream! 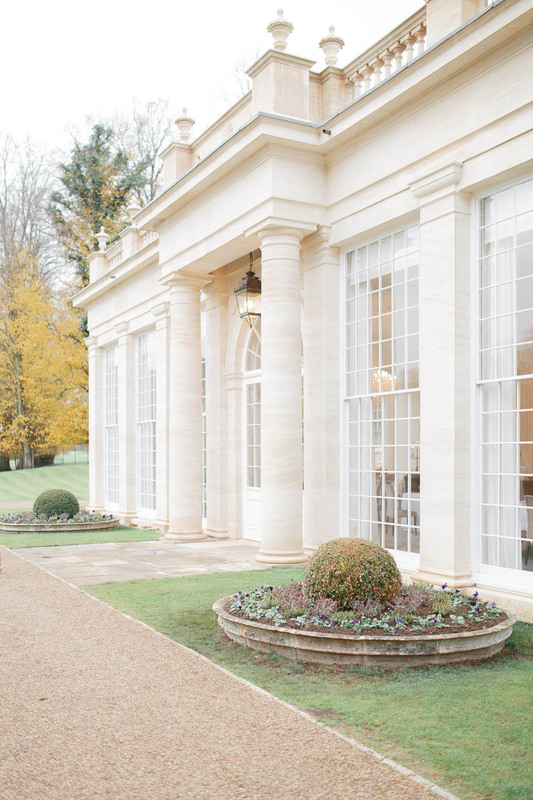 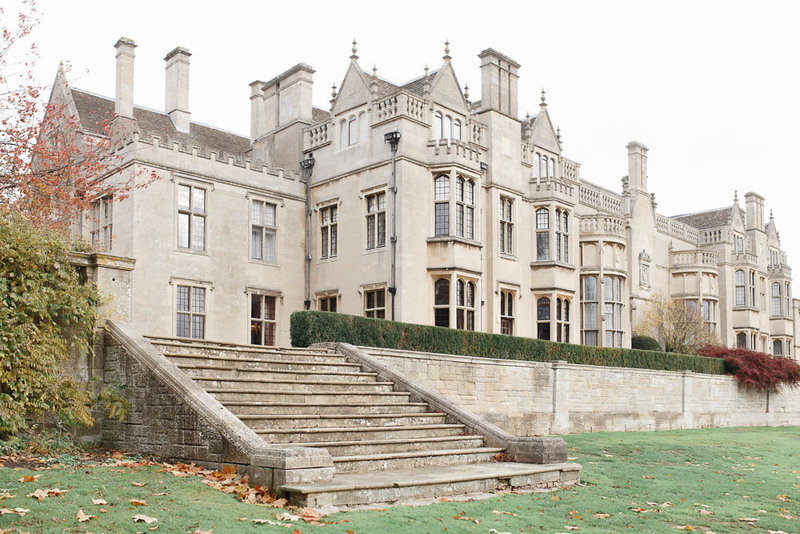 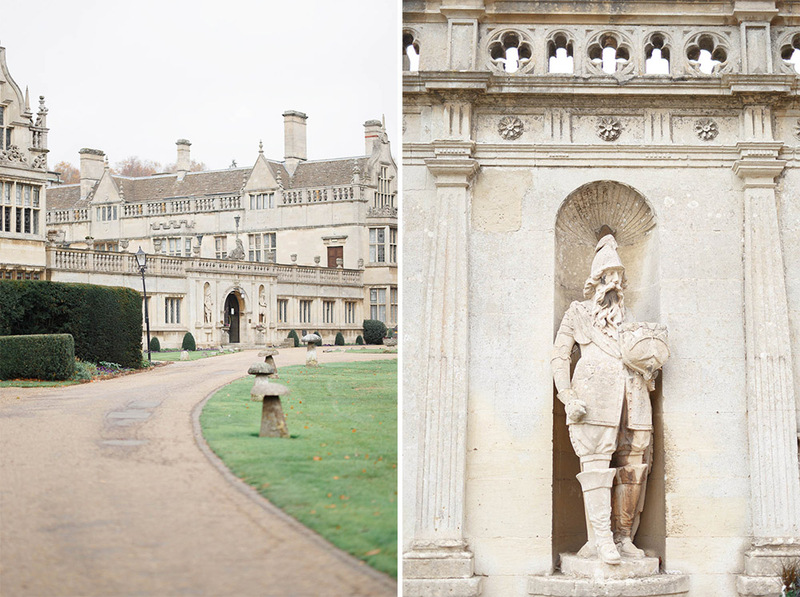 The orangery provides a wonderful contrast to the traditional, more ornate parts of Rushton Hall, but with both being built from light stone they still feel very much connected. 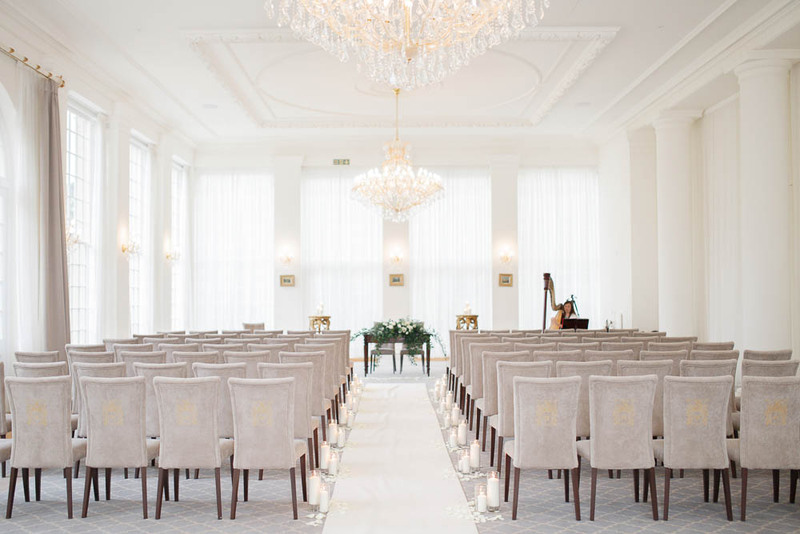 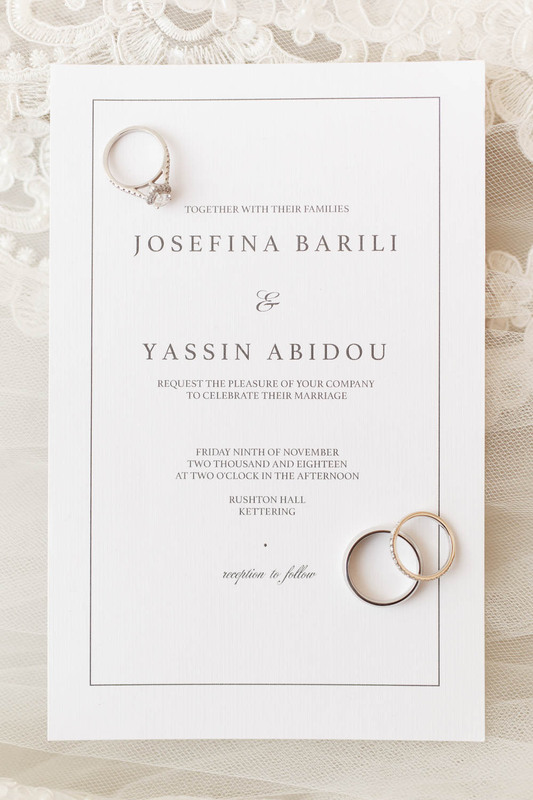 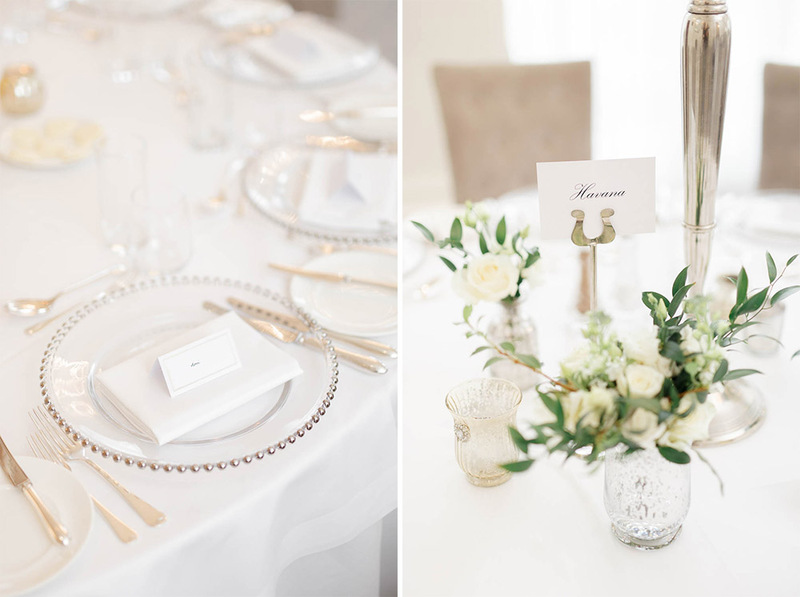 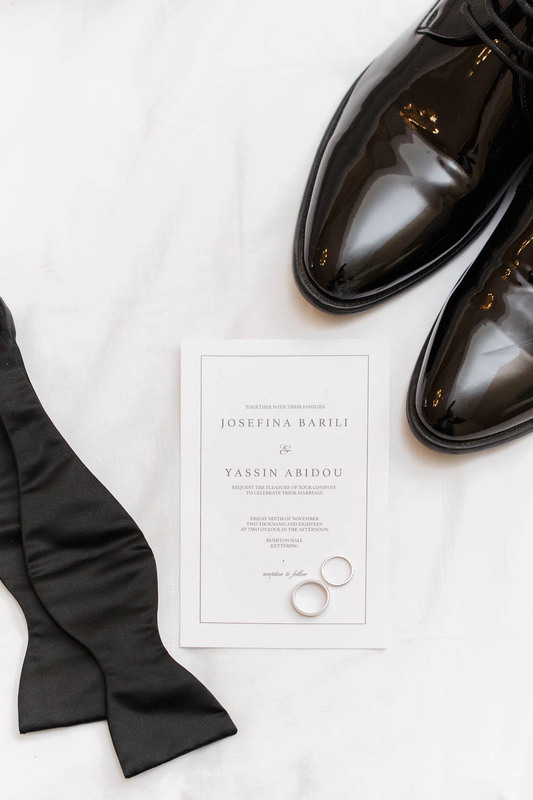 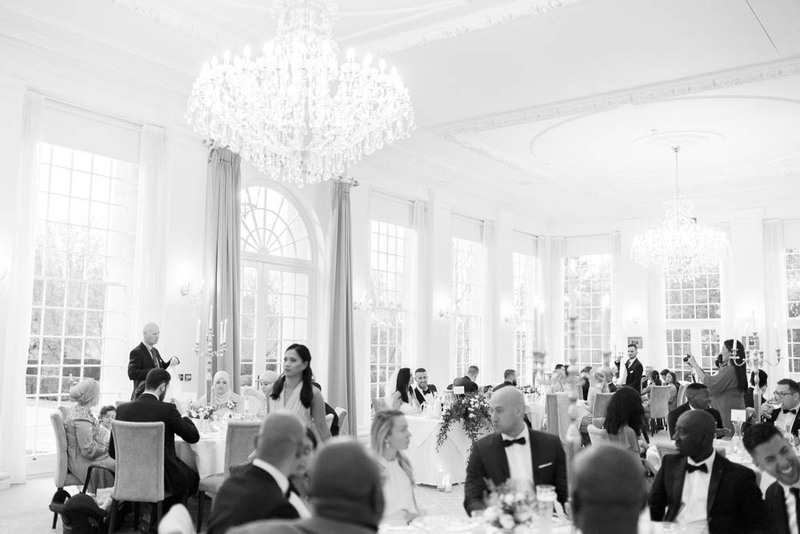 The venue, in combination with Josefina & Yas’s impeccable taste and styling, made for a timeless aesthetic. 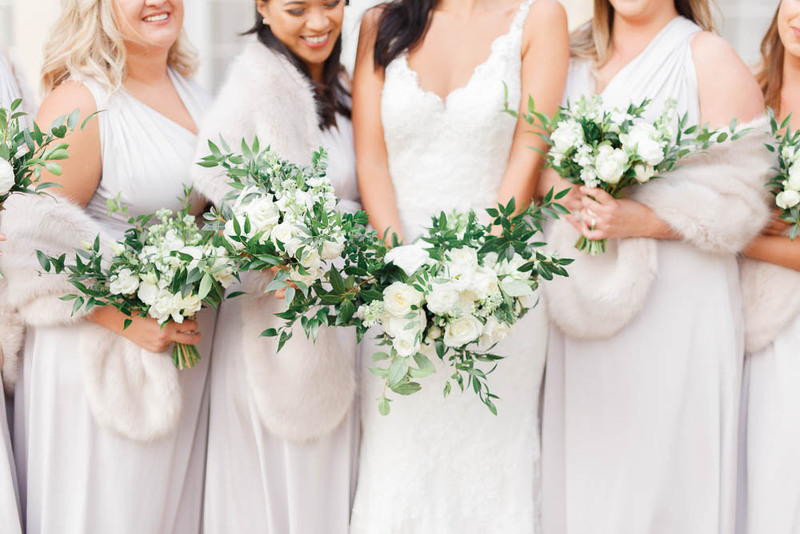 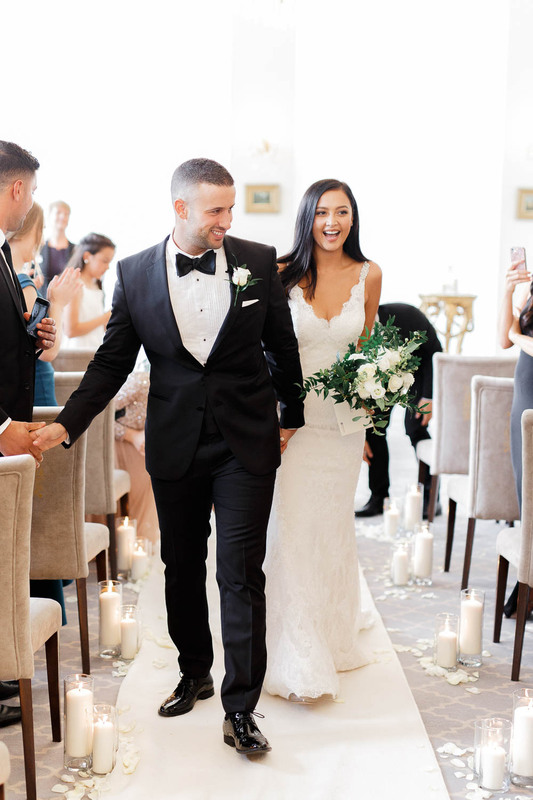 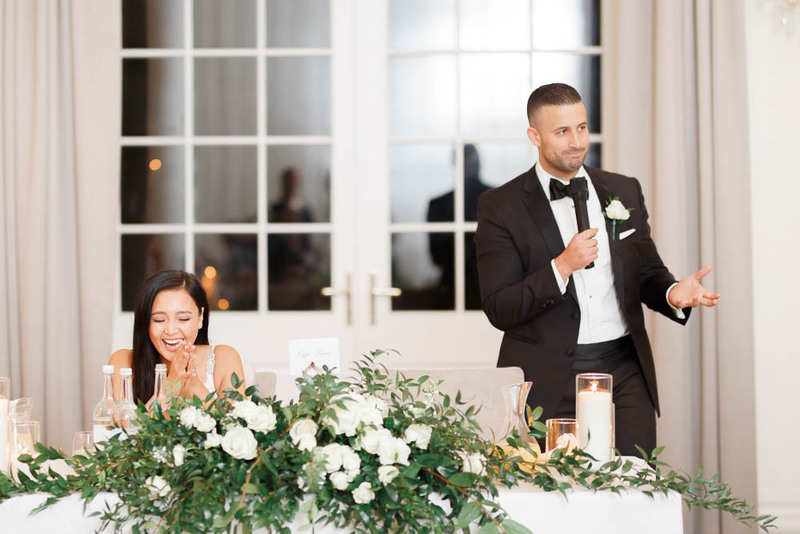 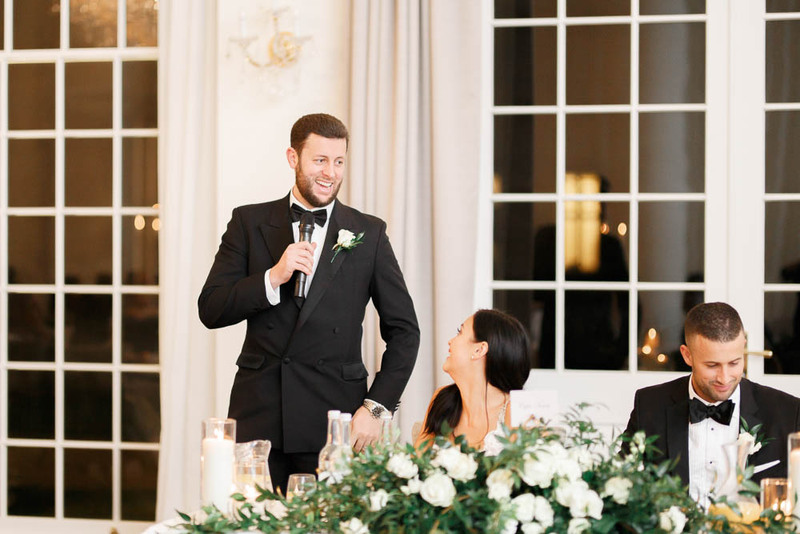 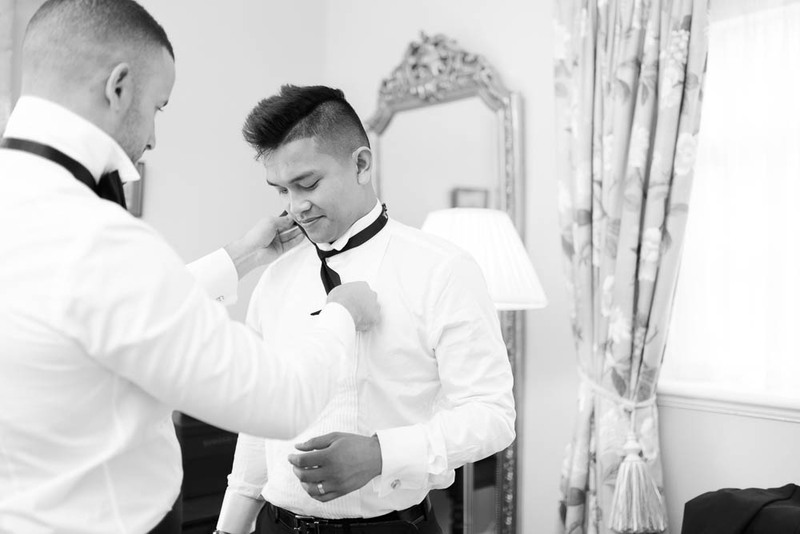 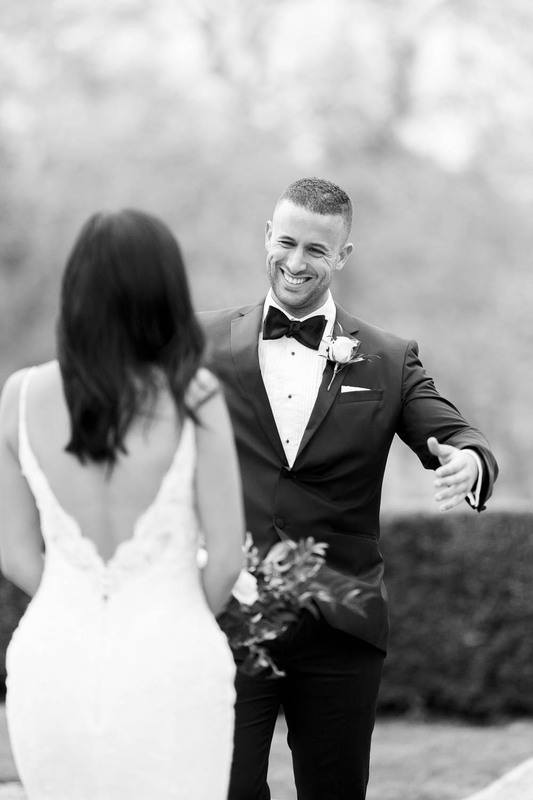 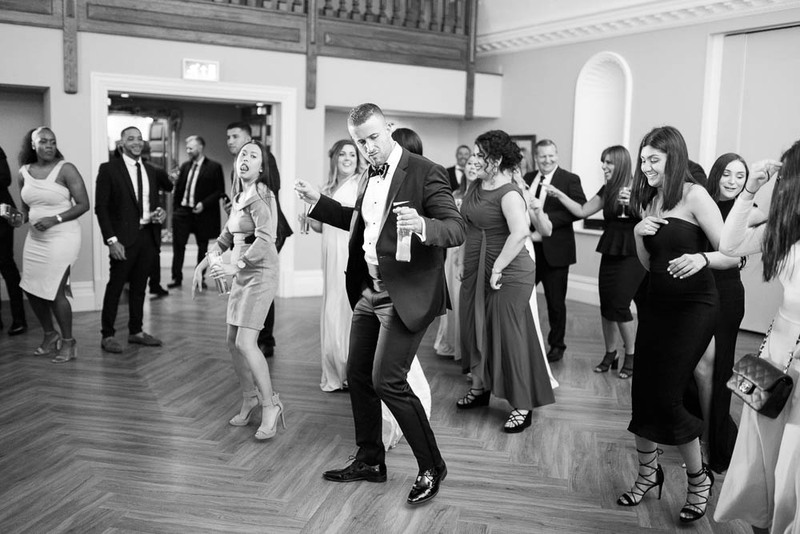 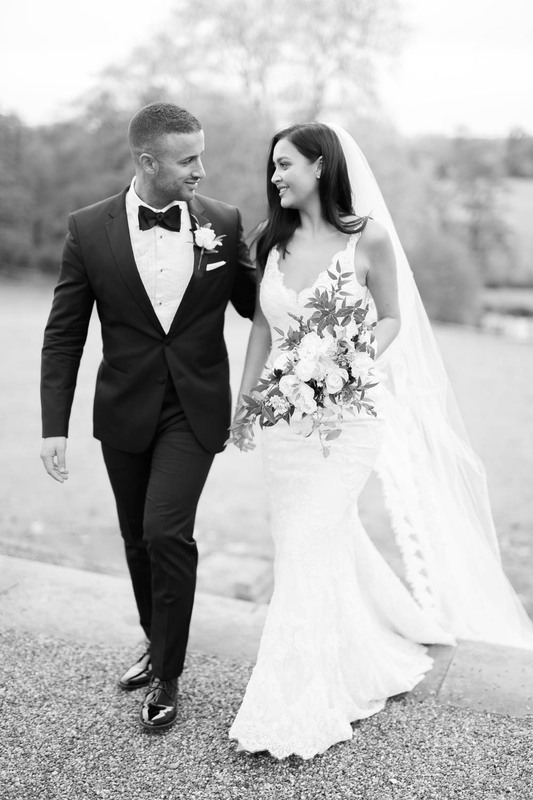 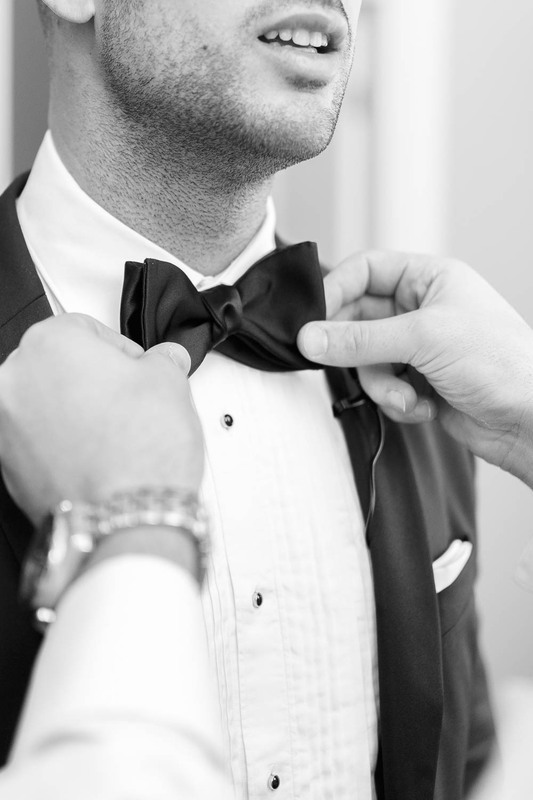 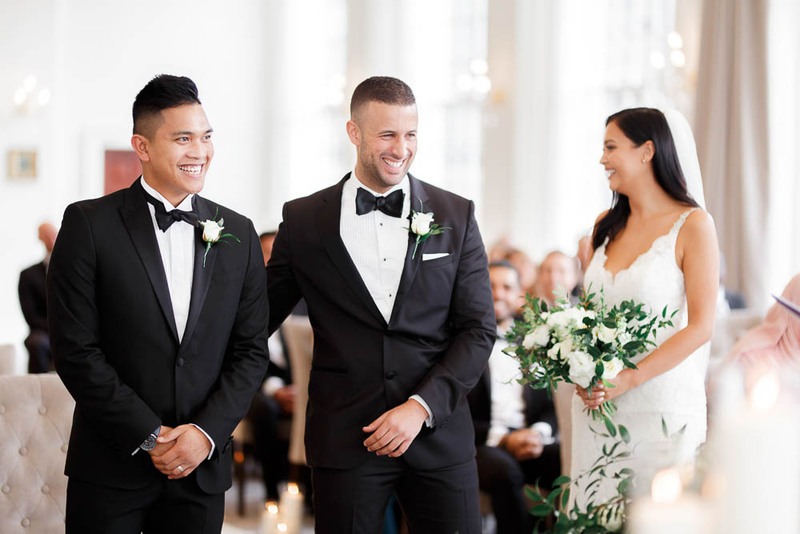 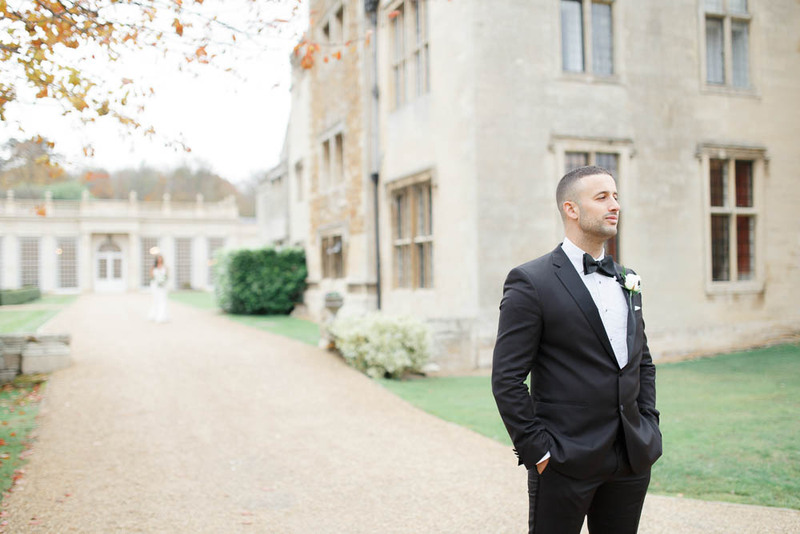 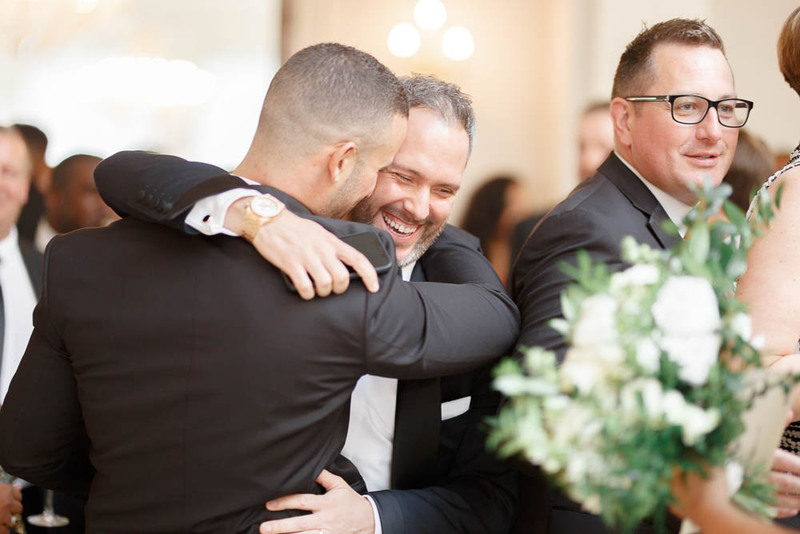 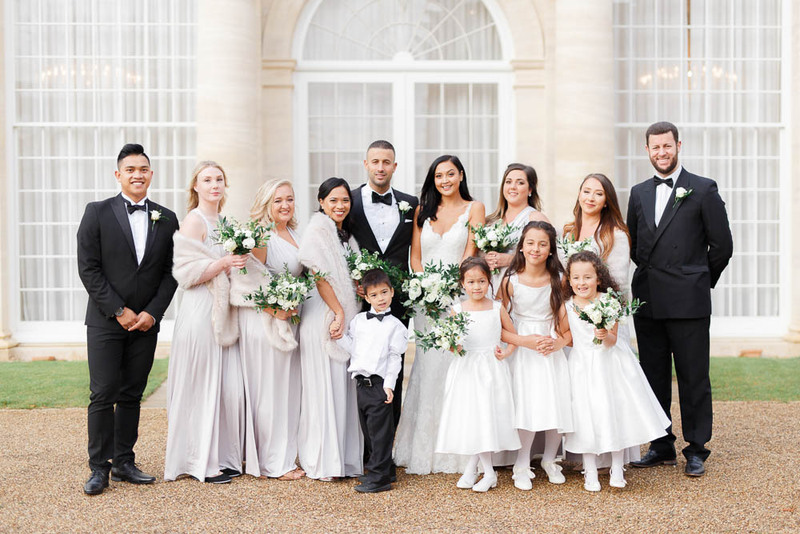 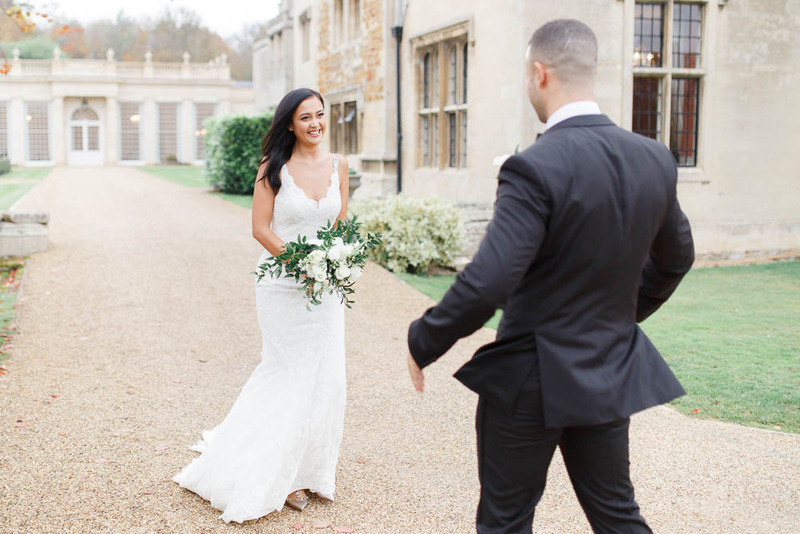 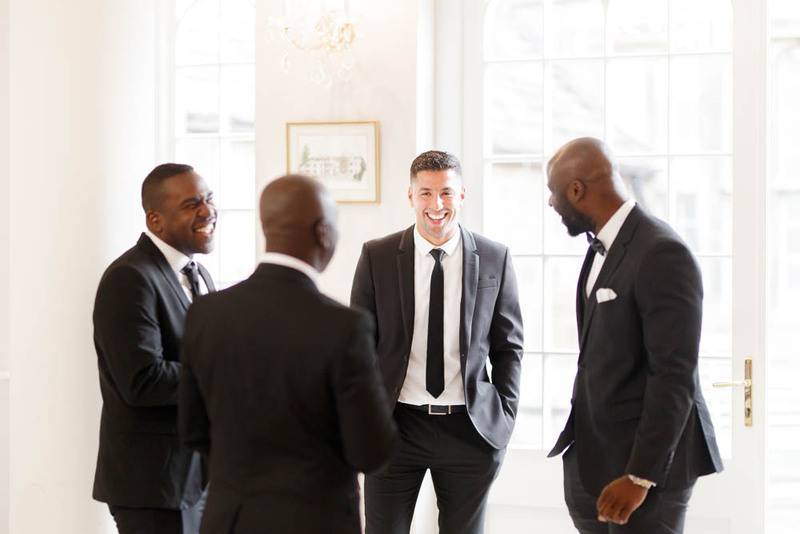 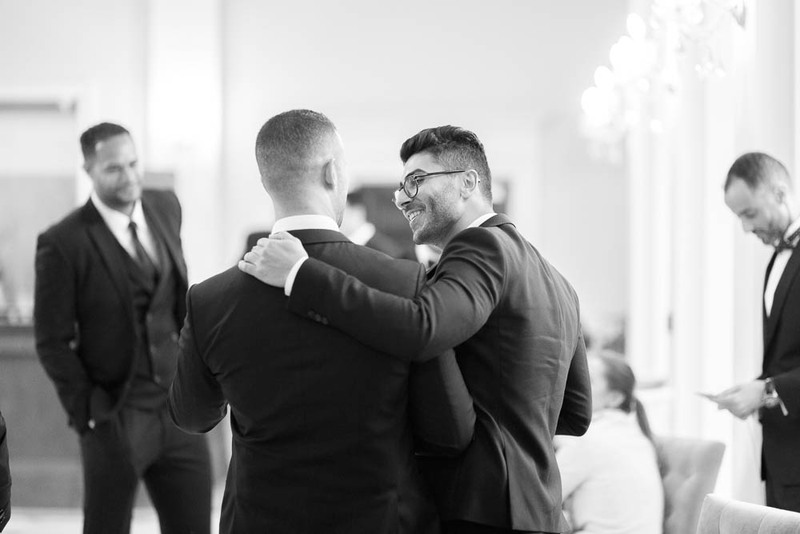 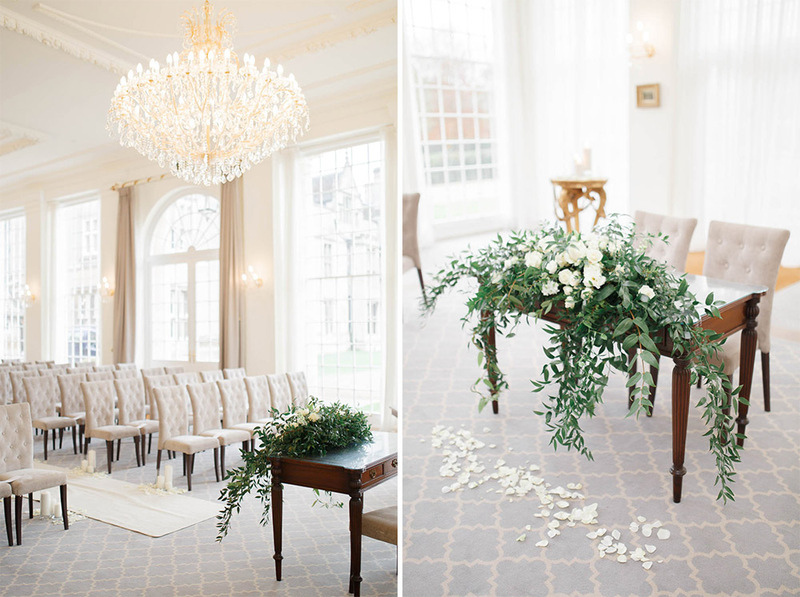 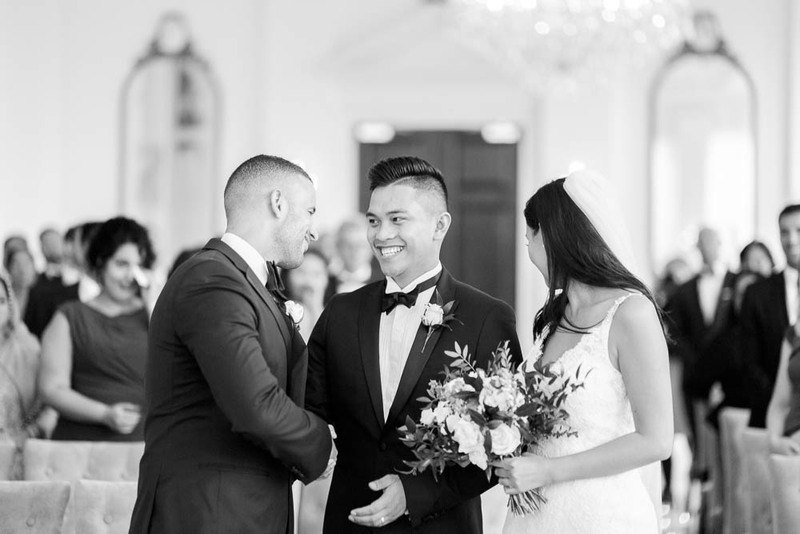 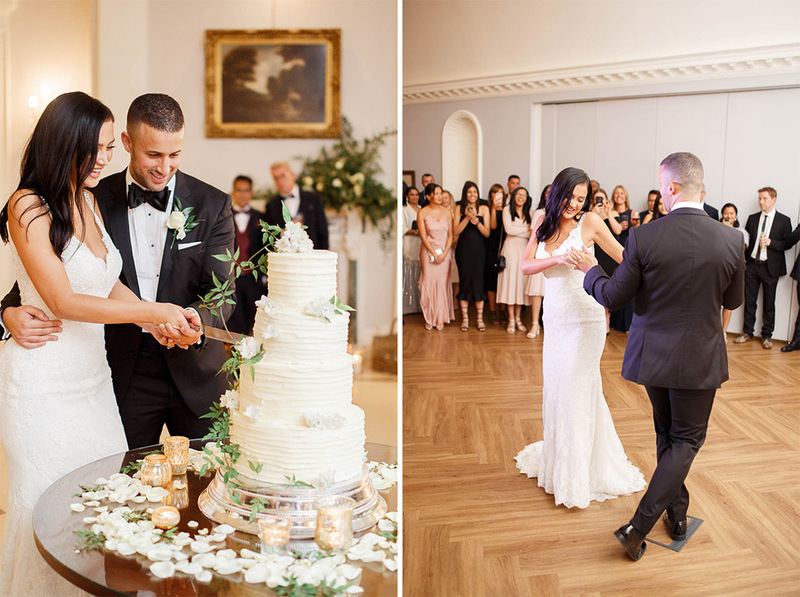 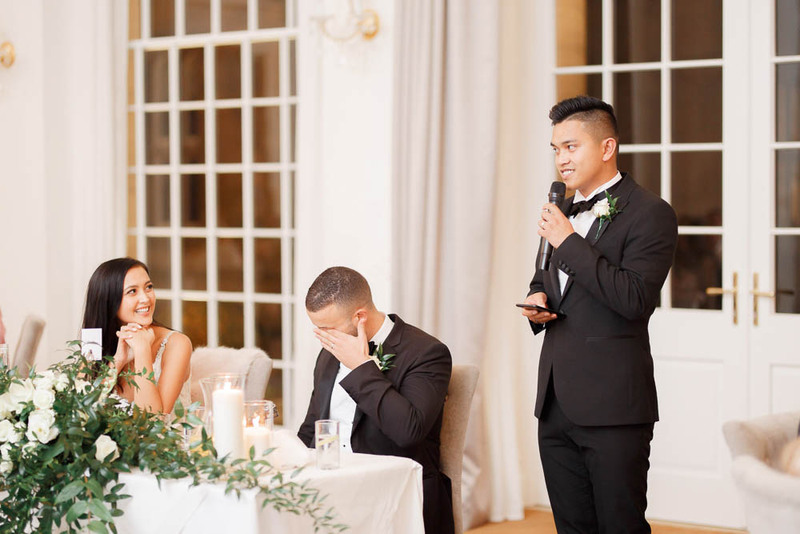 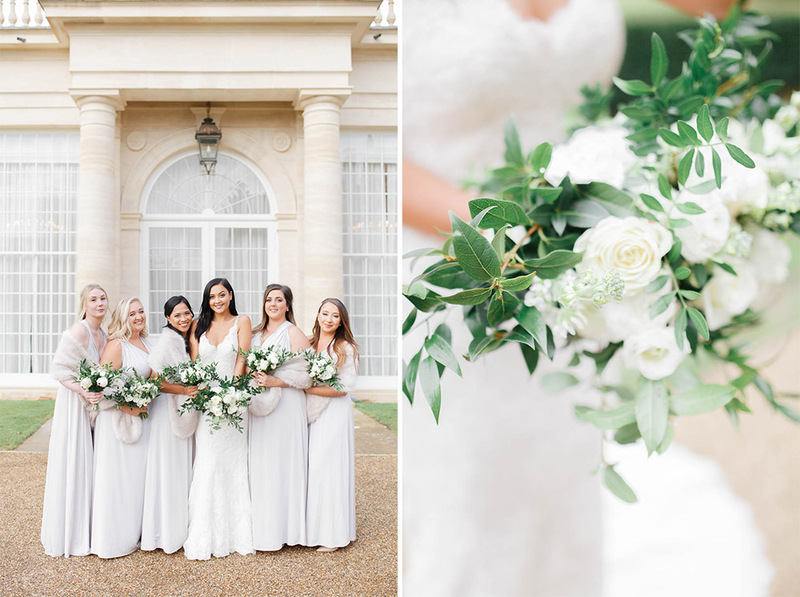 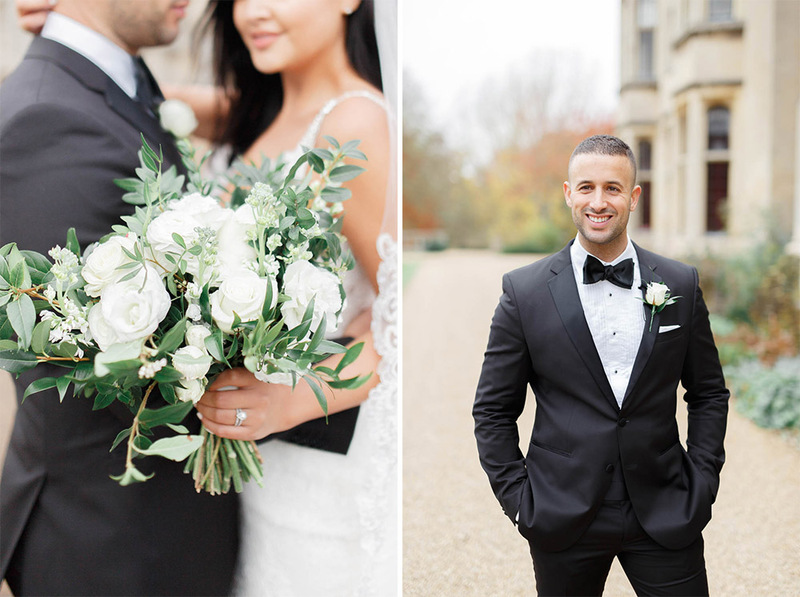 Clean, crisp whites and greens for the florals, alongside a black tie dress code, the groomsmen in tuxedos and a stunning fitted Pronovias gown for the bride, all contributed to a very classic look. 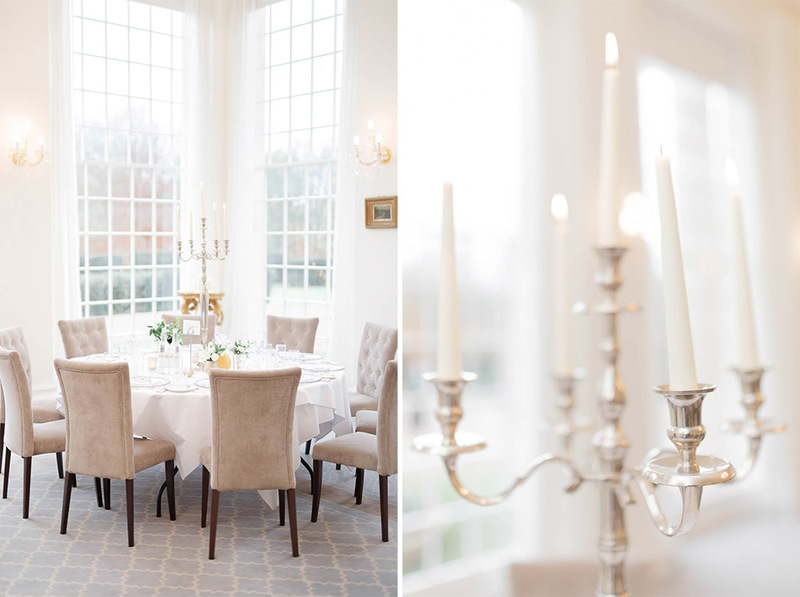 Candles filled the venue and created a wonderfully warm atmosphere – very welcome on a chilly November day! 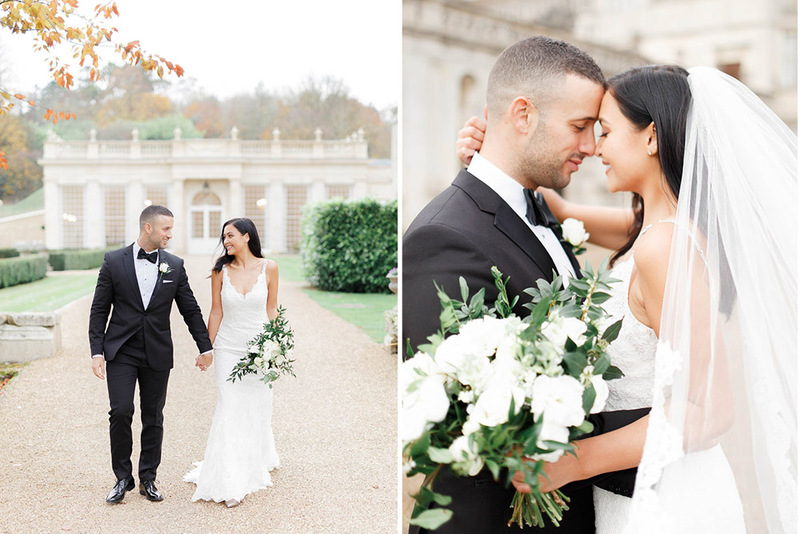 Josefina & Yas picked the perfect date – there were still some autumnal leaves lingering on the trees and on the ground, and thankfully the weather wasn’t too chilly. 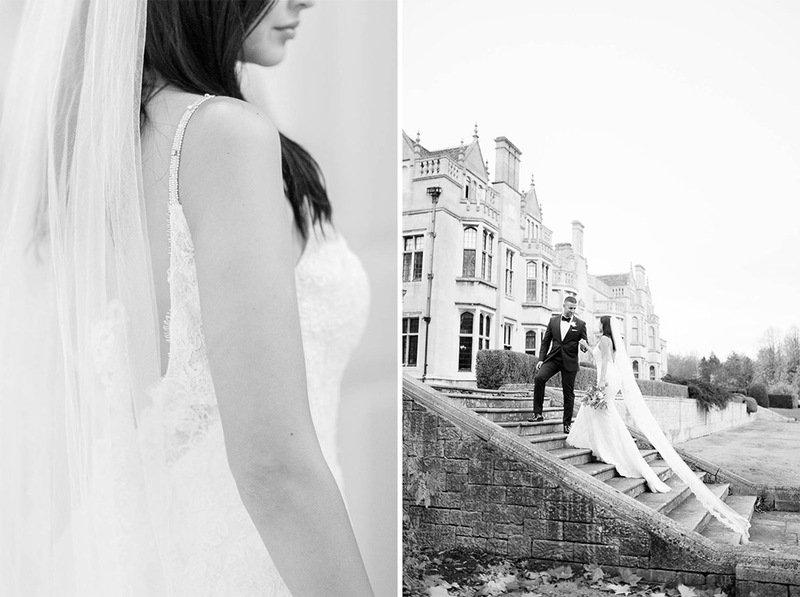 One of our favourite moments from the day was without a doubt the first look. 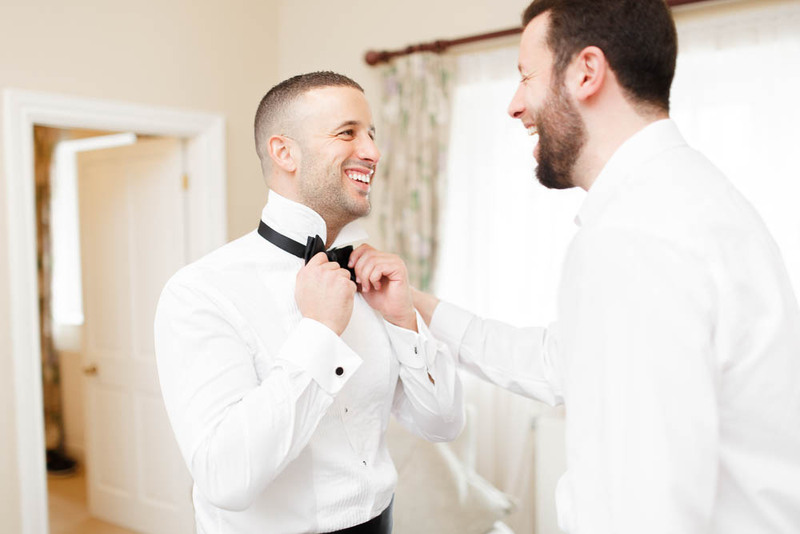 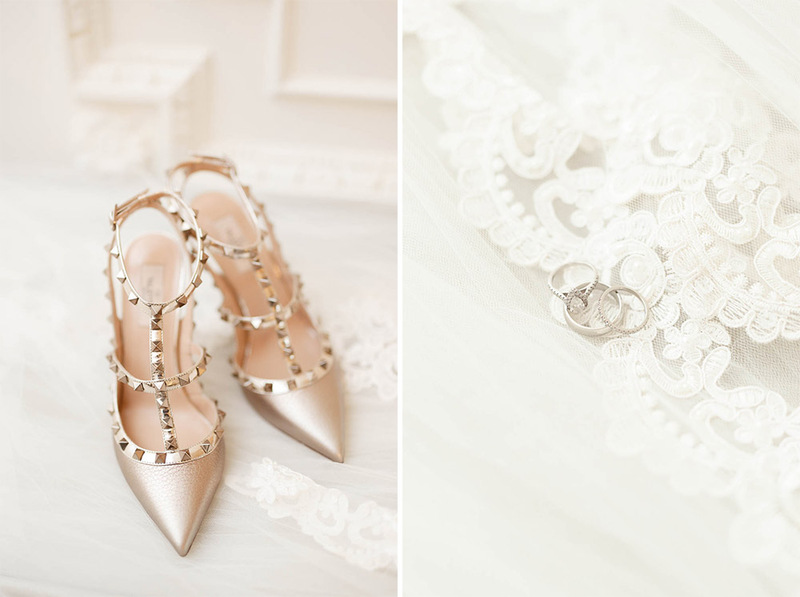 Choosing to have a first look is a very personal decision, but we have to say we love them (and actually did one ourselves when we got married!). 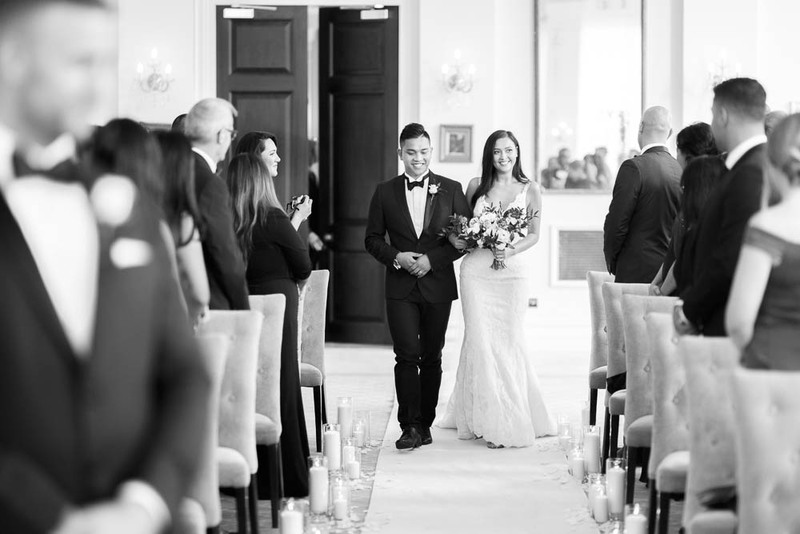 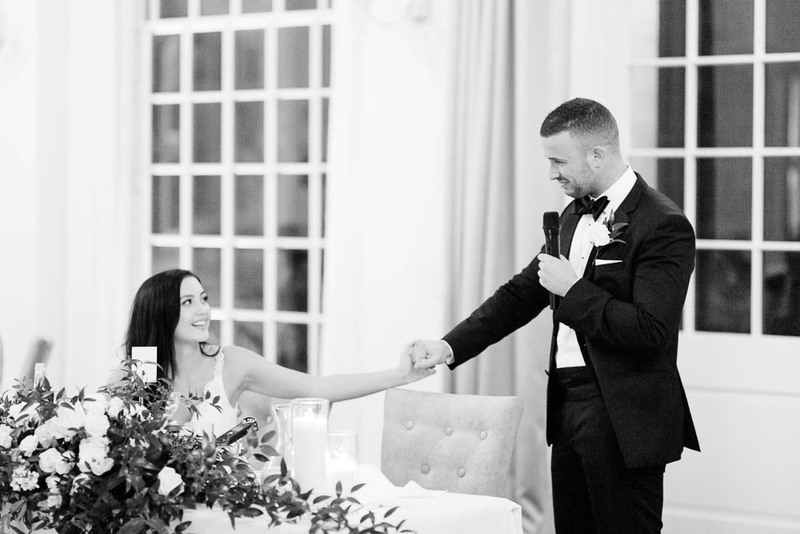 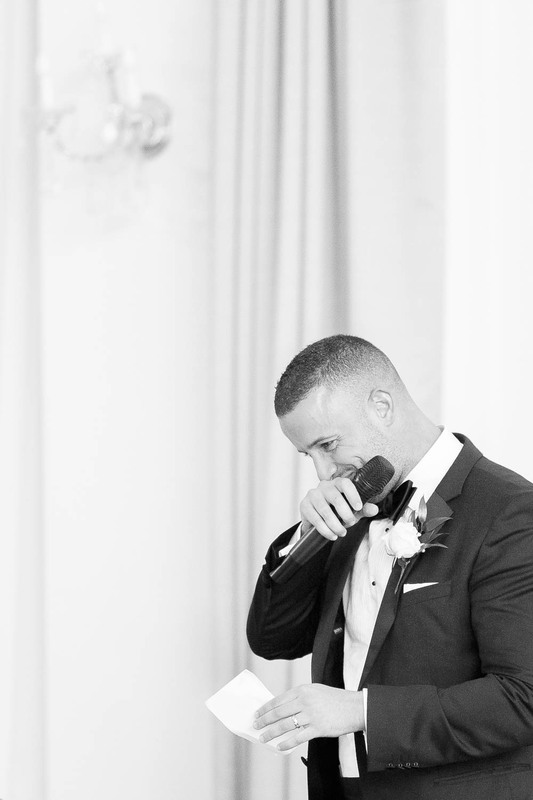 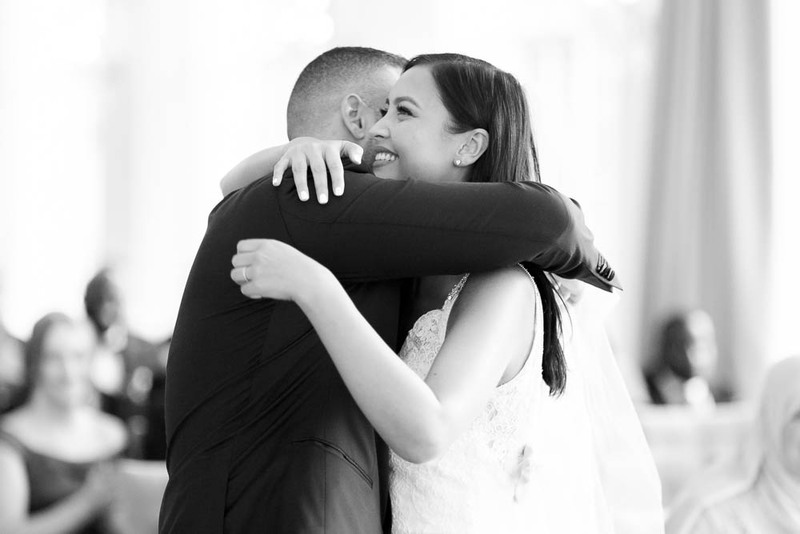 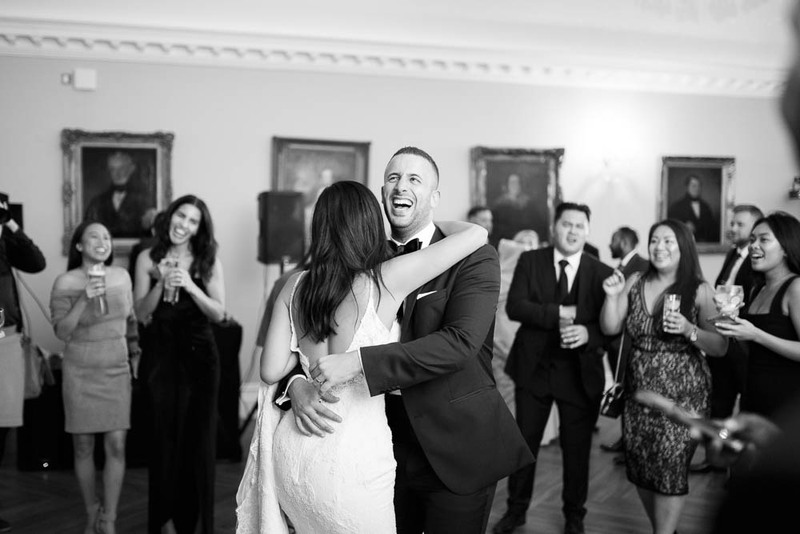 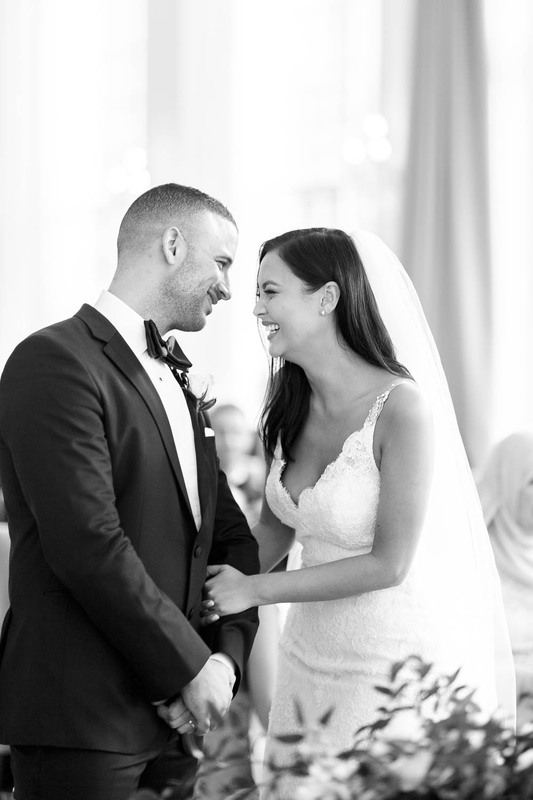 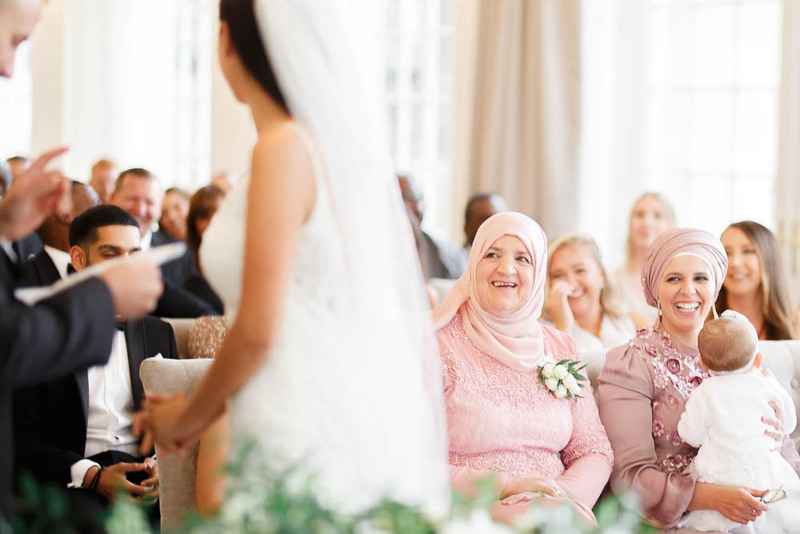 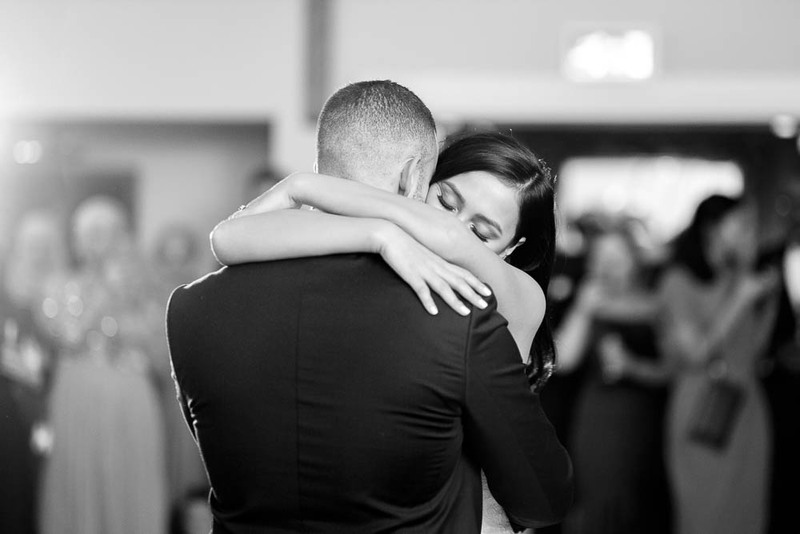 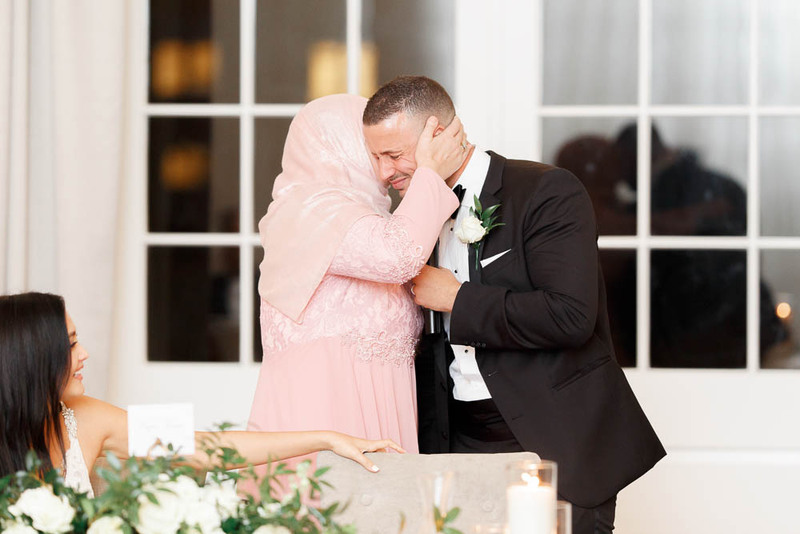 They really allow you both to share an incredibly special moment together, before all of the formalities and chaos that a wedding day can bring. 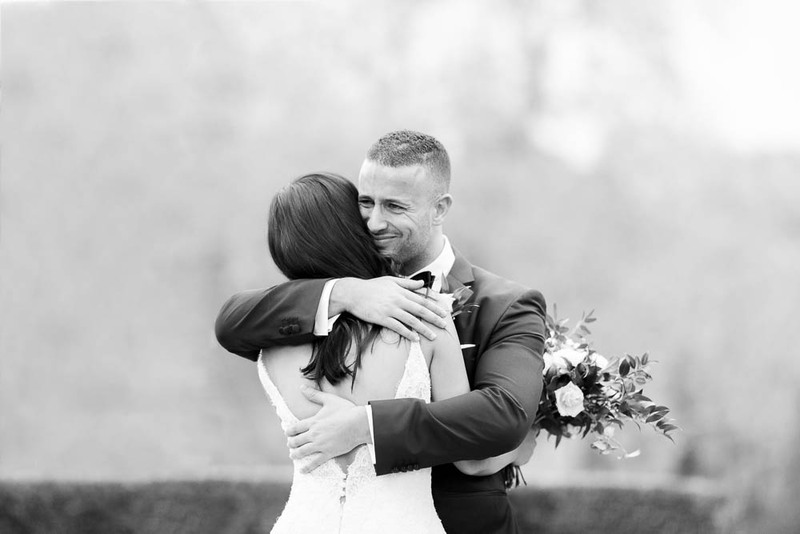 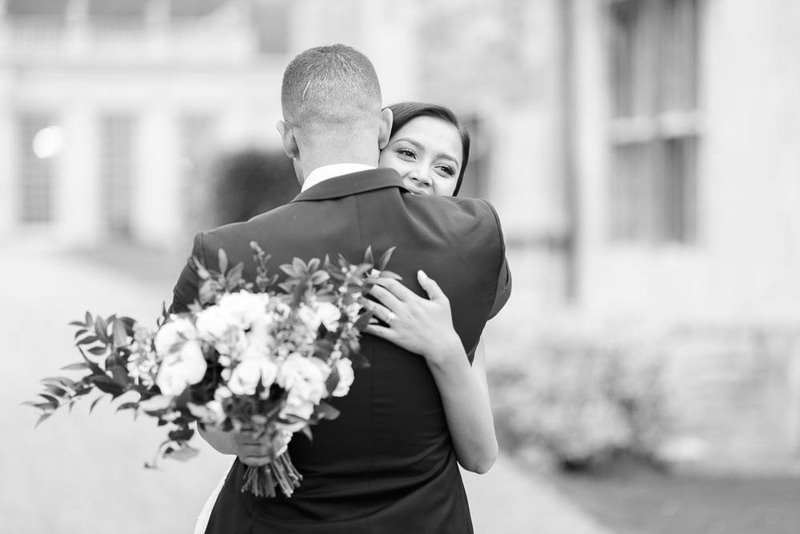 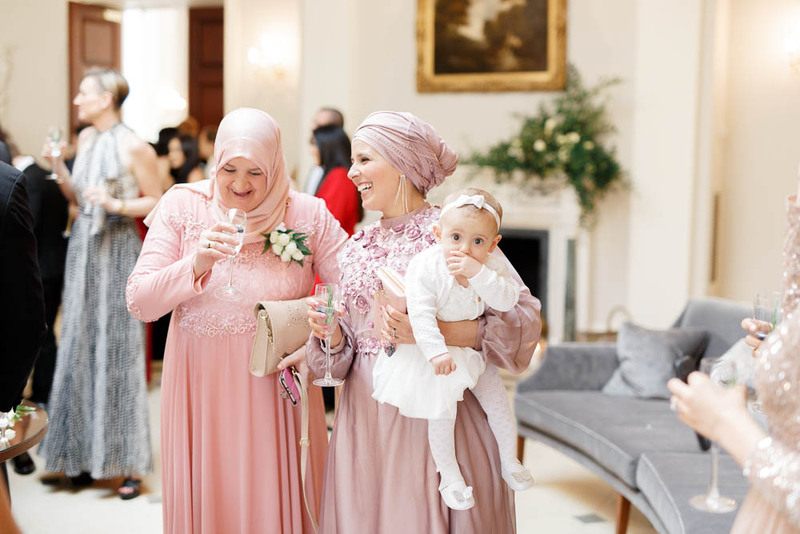 First looks also have one big practical advantage – they are a great opportunity for you to have some couple portraits taken, meaning more time with your guests later in the day. 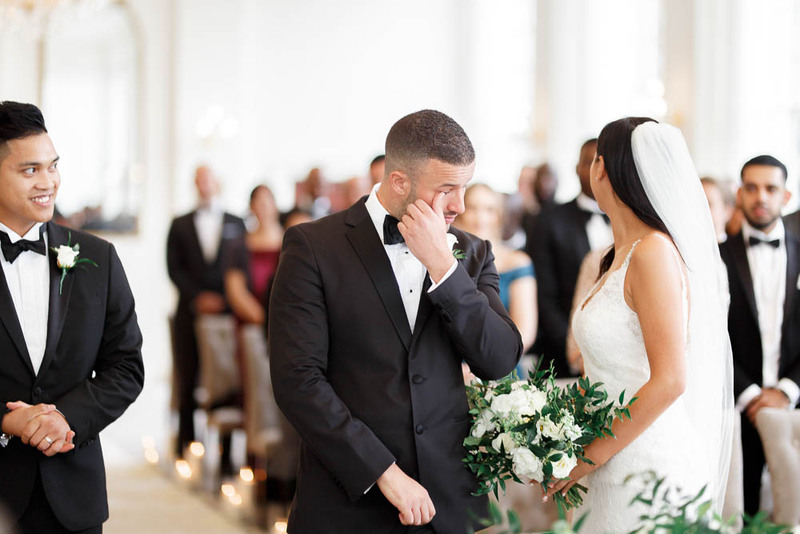 Yas’s teary reaction when he turned to see his beautiful bride approaching him will stay with us for a very long time. 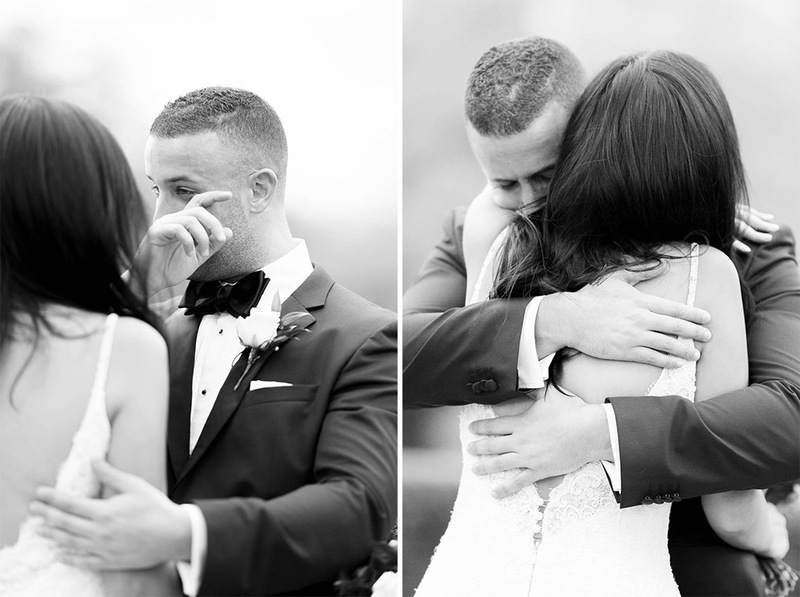 These two certainly weren’t the only ones with tears in their eyes! 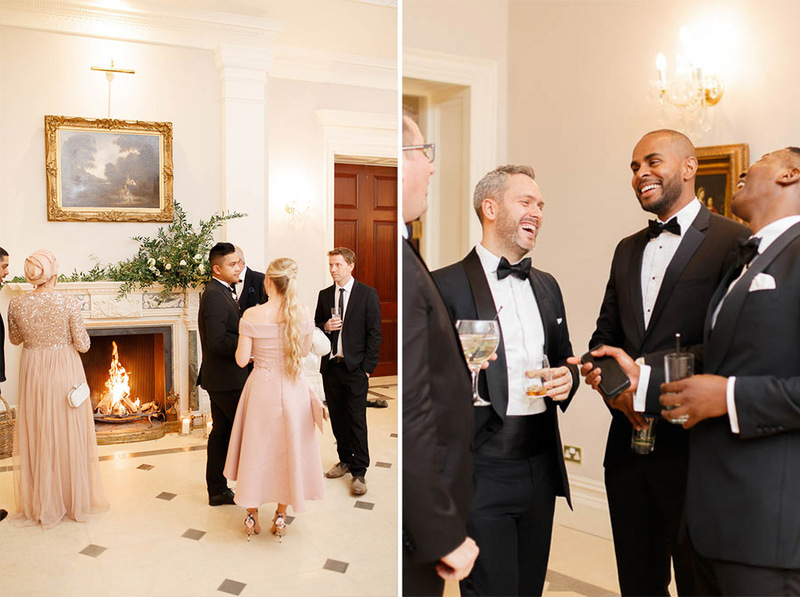 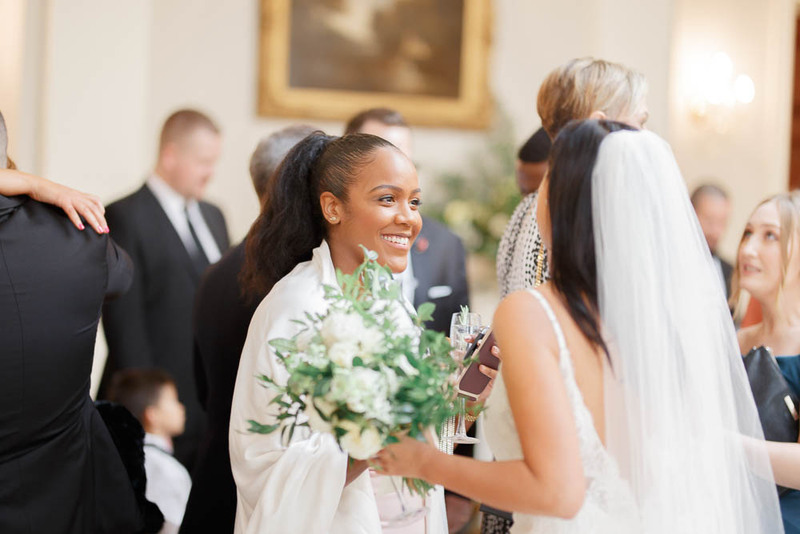 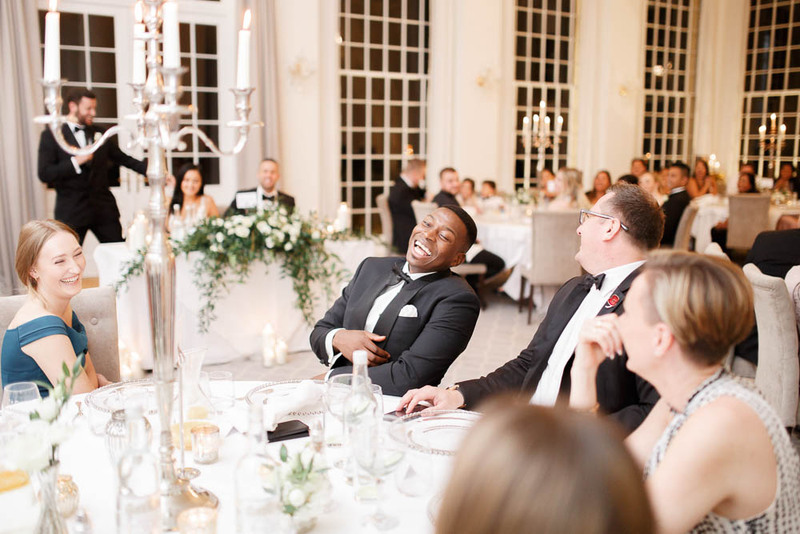 Mr & Mrs Abidou, you two certainly have a very special place in our hearts, and we will never forget all the wonderful and emotional moments that we were lucky enough to share with you on your day!